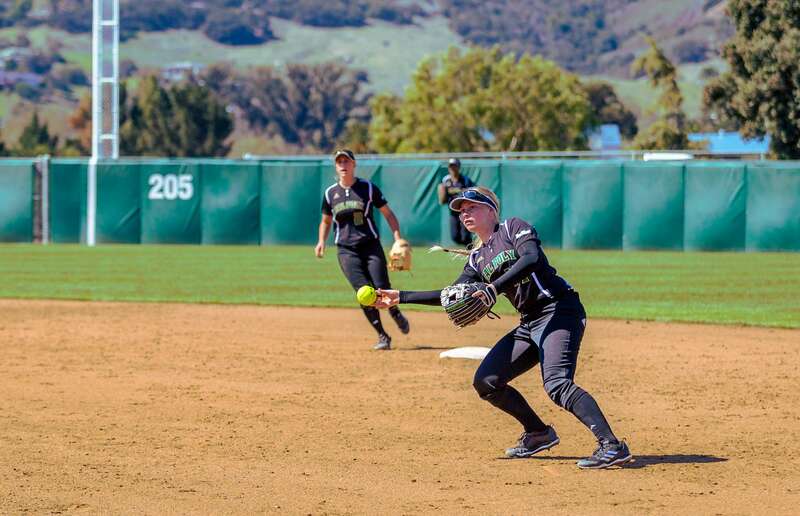 Senior right-hand pitcher Lindsey Chalmers led the way again for the Cal Poly softball team as they swept all four games of their first tournament at Bob Janssen Field in the 2018 season. The Mustangs took down North Dakota and Marist twice during the ShareSLO Mustang Classic March 9-11 to move to 13-9 this season. Chalmers threw a complete-game shutout en route to a 3-0 win over North Dakota to start the ShareSLO Mustang Classic for Cal Poly Friday. The Mustangs (10-9) started slow offensively after a lead-off double, but Chalmers kept the Fighting Hawks (12-10) quiet. Chalmers retired the first eight batters in order and maintained a no-hit bid through 4 1/3 innings. Cal Poly got the offense rolling when senior third baseman Stephanie Heyward reached on error to lead off the inning. After a bunt moved her to second base, Heyward reached third on a passed ball with one out. Sophomore first baseman Hailey Martin then hit a sharp fly ball to left field, scoring Heyward on a close play at the plate. North Dakota had a chance to score after Fighting Hawks junior Marina Marzolina hit a stand-up double in the ensuing inning to break up Chalmers’s no-hitter with one out. Chalmers responded by striking out the next two batters. Chalmers recorded her second shutout performance of the season in the 3-0 win while matching her season-high total for strikeouts with eight. Cal Poly held Marist scoreless for six innings to secure a 2-1 victory Friday. The Red Foxes strung together two hits with two outs to take a 1-0 lead after the top of the first inning. In the next half inning, Heyward started a two-out rally for the Mustangs with a triple through the alley past two falling outfielders. Junior right fielder Crimson Kaiser followed suit by driving in Heyward with a sharp line-drive hit to left field to tie the game. Right after that, Kaiser scored from first base thanks to a double from Martin. Strong pitching by sophomore right-hand starter Steffi Best and sophomore right-hand reliever Shelby Jeffries held on to their 2-1 lead at the end of the first to eventually take their second win of the tournament. Chalmers allowed only two hits in Cal Poly’s second game against Marist, as the Mustangs took a 4-1 win Saturday. In the bottom of the third inning, the Mustangs opened the scoring as a single by Heyward allowed junior catcher Makenna Young to score. Freshman left fielder Noellah Ramos added another run off of a wild pitch by the Red Foxes, giving the Mustangs a 2-0 lead. Marist looked to respond at the top of the fourth inning, but their one run was not enough. Jeffries responded for the Mustangs with a home run to bring the Cal Poly lead back up to 3-1. Chalmers kept the Red Foxes to zero hits for the remainder of the game, while the Mustangs tallied their final run in the sixth inning as Young singled to send sophomore pinch runner Alyssa McKiernan from second base to home for the final score of 4-1. Cal Poly beat North Dakota 4-3 with a walk-off single by senior center fielder Amanda Sandoval in the seventh to push the Mustangs’ win streak to six Saturday. In the sixth inning, the Mustangs scored two runs with two outs, taking advantage of three North Dakota errors. With the bases loaded, North Dakota allowed one run on an error and one with a walk to give Cal Poly a two-run lead going into the final inning. However, North Dakota responded by stringing together three hits to tie the game at 3-3. Chalmers retired the next two batters to keep the tie, leaving two Fighting Hawks on base. Young put the Mustangs in position to win with a one-out double to right-center. The next batter, Sandoval, singled up the center to drive in Young for the walk-off victory. Despite giving up the lead in the seventh, Chalmers secured her ninth win of the season, and her third of the weekend. Chalmers gave up only three runs through 16 innings pitched this weekend, two of which came in the seventh inning against North Dakota. Cal Poly (13-9) will play two doubleheaders March 17-18 against Illinois and Fresno State with hopes to continue their win streak.